According to The Flag Bulletin #189 [fbn], the original houseflag of the company became the inspiration for the Japanese postal flag (Figure 14, page 181, text on page 180). A more recent version uses wider stripes to create five equal stripes. The Flag Bulletin translates Nippon Yusen Kwaisha as Japanese Mail Ship Company. The two red lines are meant to represent the katakana ni the first syllable of Nippon, extending the upper portion of the glyph to the borders of the flag. The company dates back to 1870 when the Tsukumo Shokai Shipping Company was formed by the Tosa Clan. This company was renamed several times until it became the Mitsubishi Mail Steamship Company in 1875. In 1882, another company was formed, the Kyodo Unyu Kaisha and in 1885 it merged with Mitsubishi Mail Steamship to become Nippon Yusen Kaisha (later Nippon Yusen Kabushiki Kaisha). [NYK] In 1923, it's Near-Sea Department became a separate entity, Kinkai Yusen. It's twin stripes became a feature of its funnel in 1929. NYK acquired Kinkai Yusen Kaisha in 1939. NYK emerged from the war with only 37 ships operating. In 1964, NYK merged with Mitsubishi Shipping Company to become the NYK Group. In 1991, NYK acquired Nippon Liner Systems, a container liner to New Zealand. Showa Lines merged with NYK in 1998. Various flag band widths are shown by sundry sources resulting, according to the company, from the fact that there were no actual specifications until 1939 and consequently actual variations abounded. To help assist confusion is the fact that the funnel bands are not equal i.e. the outer white are slightly narrower than the others so anyone trying to work out the flag from the funnel is on the wrong track for a starter. After the merger with Mitsubishi Kaiun K.K. the name of Nippon Yusen Kaisha was retained according to Lloyds, as happened after they acquired Showa Kaiun K.K in 1998. Tokyo - blue flag, white stylized "NLS". The house flag (as a drawing) is shown right away: see attachment < jp~hino.jpg > . Dark blue field, a white shield shape bearing red enlaced initials ‘H’ and ‘Y’ above a thin blue line. Funnel detail (photo by Geert van Kesteren) for want of a really good image. NYK-Hinode Line, Ltd., since its founding in 1912 as Hinode Kisen Co., Ltd., has continued to develop primarily as a carrier of heavy cargo. In recent years, it has engaged mainly in the transport of plant equipment and steel to the Middle East and Southeast Asia. In February 2001, it became a wholly-owned subsidiary of Nippon Yusen Kaisha (NYK Line) [and] took over not only the powerful Indonesia-centered Southeast Asian service network of Tokyo Senpaku Kaisha, Ltd. (TSK), but also the long-standing conventional service networks of NYK Line covering mainly Europe-Mediterranean, East Africa, Australia, India and the U.S. (…) In July 2002, Hinode Kisen was rechristened NYK-Hinode Line, Ltd. to mark its rebirth as a member of the NYK Group. From 1964 till 1998, Hinode belonged to the Showa Group. The fleet now numbers 45 ships; much is expected from the ‘New Multipurpose Heavy Lifter’, see: http://www.nyk-hinode.com/english/nms.html. Shofuku Kisen K.K. Formed 1937 it is now part of NYK group. Tokyo - white flag, red interrupted circle, red "S". Tokyo Senpaku K.K. dates from 1949 as either a rename or a re-formation of Nanyo Kaiun K.K. Declared bankrupt in 1984 it has survived as a subsidiary of Nippon Yusen Kaisha and the colours are apparently still used (as of 2001). Tokyo - Israeli-style White-Blue-White-Blue-White- flag, in center white square, red 5-pointed star, white disk. This Tokyo based shipping company is one of many flying a house flag in the Japanese national colours. The company website has an English version. A few highlights gleaned from the ‘Company History’ section: founded in 1956; since 1964 part of NYK; subsidiaries founded in 1964 (Taiheiyo Nojo Co., agriculture!) and 1966 (Taiheiyo Enkai KK, domestic shipping). Major shareholders are NYK, Showa Denko, and a number of non-maritime companies. From the ‘Activity / Business Outline’ section we learn that the firm transports raw materials and fuel for the principal shareholders (listed are nickel ore, bauxite, coal, cement, oil, etc.). In addition, NYK ships are managed and there is a trend towards shipping for third parties. The ‘Fleet’ section has two divisions namely ocean going ships, and coastal ones. I did not see the house flag on any picture on the website, only a drawing. On a white field are placed two red horizontal stripes, interrupted by a large red initial ‘P’ (no serifs - why that particular letter?). We may count five equal stripes in all White-Red-White-Red-W; the initial stays within the central three. The Japanese NYK Global Bulk Corp., "the specialist in handy bulk carriers of the NYK Group", maintains a homepage in English. The globally active fleet "consists of 100 bulk carriers of the 20,000 to 50,000-ton deadweight capacity class, and handles a wide diversity of cargo such as steels, coal, iron ore, salt, cement, grain, fertilizer, lumber, forest products, and so on. The fleet overview is rather interesting as various sorts of bulk carrier are presented namely Handy (max. 60.000 dwt), Panamax (max. 80.000 dwt), and Cape (min. 100.000 dwt). Most of these vessels fly the Panamanian flag. Founded in 1988 as Toho Kaiun, fully owned by NYK, the company is based in Tokyo and works for various NYK branches including Hinode. A name change to NYK Global Bulk occurred in 2002 when all NYK bulk carriers were taken over. 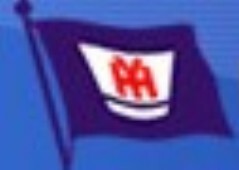 The house flag - a drawing - appearing on the site, and shown painted on a ship’s bow, is attached as < jp~nykg.gif > : white with very narrow horizontal edges in light blue, a large red initial ‘N’ in the centre. The initial’s diagonal stem consists of two stripes - judging by the flag painted on the bow they do not touch the vertical parts although they do so on the small drawing. As the company puts it neatly on the website, English version (bottom of page), Kaiyo Kogyo is a member of the NYK Group, a tugboat operator, founded in 1963. The company is established at Yokohama; towing activity takes place mainly to the north of that port and now includes rescue operations ("maritime disaster prevention service"), salvage, marine surveying and - interestingly - spacecraft recovery! A trading company as well, Kaiyo Kogyo is engaged in brokering tugboats, forwarding of ships, and shipbuilding consultancy. The ‘Fleet’ section presents ten tugs, two of them of small size, and two other vessels ("line boats"). However the following page gives a good idea of the company’s wider influence as a number of related firms are listed, covering an important part of Japan’s east coast. This page (only in Japanese version) has a number of photos covering company history. Shown on the webpages and attached as < jp~kaik.gif> (a drawing), the house flag has five stripes WRWRW with a large blue initial ‘K’ (fimbriated where necessary) over all. The stripes have the same width as evidenced by a photo appearing regularly on the introductory page "Challenge, to the future": enlarged detail attached as < jp~kaik2.jpg> .